Traditional CCTV and video monitoring has historically meant one camera and one monitor with a cable connecting the two. Modern systems are now far more complex including use of a wide variety of techniques and technologies. 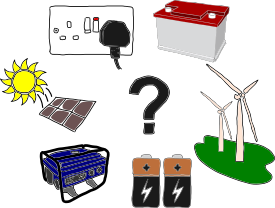 The vast majority of this equipment requires mains power. This is generally not much of an issue in the average urban setting and we have seen explosive growth in the number of CCTV and monitoring systems being installed. The desired effect is that there is now a real chance of detection whilst carrying out crime. The knock-on effect is that the criminal element of our society is now increasingly looking outside the urban environment for easy targets and those that carry lower risks of detection but with high reward. Where better than the rural environment, where the adoption of CCTV is significantly lower and access to farms and other unattended locations is very, very easy? Unfortunately, many rural sites have no security measures other than the security equivalent of the suitcase lock. The biggest challenges facing establishing equipment in remote locations are power, operation, maintenance and the vast rural expanse to be covered. All provide significant implementation issues. With respect to power, it is quite possible, although highly impracticable, to use existing mains powered equipment and provide the power via a small generator. Although this method works, it throws up big hurdles such a high implementation cost and ongoing running and maintenance costs for the equipment. The camera equipment itself may be low cost, but the fuel bill to run the generator is not. A more suitable power alternative is needed and solar or wind power provide this. Firstly, it's widely acknowledged that one of the biggest deterrents to criminal activity is the fear of detection. This is why many people install dummy security devices and post up warning signs in the hope that any criminal looking for easy pickings will move along and look elsewhere. A combination of real and dummy devices enforces the message of surveillance whilst combining actual monitoring in key areas and a reduction in cost. Secondly, Novetic provides cameras that can be moved. Our cameras that require no wired-in power are self-contained, easy to set up and quickly redeployed. This portable solution can be used time and time again, for a wide variety of uses, across a wide area. For example, to help improve animal welfare or to monitor areas of the farm during lambing and harvest or to address nuisance issues like fly-tipping or vandalism. Our small cameras do not need too much power for continuous operation so they can operate with a much smaller solar panel than you might expect. A very effective system can be put together from a 10W panel charging a battery. The ideal charge controller for this type of installation would be of the MPPT (Maximum Power Point Tracking) variety, giving the most efficient storage of energy into the battery. Even for situations where solar power is not applicable, such as inside a barn, power can be provided or supplemented by a general purpose motorcycle battery for short term monitoring of a week or so. For longer periods a car battery will provide several weeks of operation. Remember, a camera system on its own is not enough to guarantee adequate security. As Robert Frost writes in his poem The Mending Wall, "good fences make good neighbours" and this is certainty true for security. Good common sense measures like using good quality locks and security devices, ensuring gates cannot be lifted from their hinges, keeping gates locked when not in use and controlling vehicle access, as well as taking photos of all valuable tools, equipment and livestock should all be considered too. Novetic's convenient, small and portable security cameras provide a cost effective solution. Check out our range of cameras, specifically the Blackeye Camera, and see if these might be the answer to your security problems.